For a draft of the original strategy for The Tar Sands Campaign, click here. For more from CorporateEthics, one of the organizers of The Tar Sands Campaign, click here. To see pages of U.S. tax returns showing more than 400 payments to more than 100 groups involved in The Tar Sands Campaign in Canada, the U.S. and in Europe, click here. When it becomes available, a link to the Hansard transcript will be added. As I tweeted in early November and as I told the Edmonton Journal in December, I believed that Rachel Notley had what it would take to lead Canada into the global oil market. I meant what I said. But now, sad to say, it is now clear to me now that Rachel Notley would never do what is necessary for any Alberta pipeline project to succeed. My opinion changed as of April 3, 2019 because of evidence that I came across that day, just last week. What changed my mind is an e-mail sent by Leadnow, a Vancouver-based non-profit organization, on April 1, 2019. In this e-mail, Leadnow forwarded an undated e-mail sent out by Duncan Kinney, Executive Director of Progress Alberta. By encouraging Leadnow supporters to join Progress Alberta, Leadnow effectively joined the campaign against Jason Kenney. To understand the relevance and the seriousness of Leadnow’s involvement in the Alberta election, it is important to know that Leadnow was created as part of the “Strategic Incubation” program of a Rockefeller-funded, U.S. organization that helps local organizations to swing elections in their countries (outside the U.S.). What this means is that the Rockefeller’s election machine is helping to defeat the United Conservative Party, the only political party in the provincial election that is committed to breaking the U.S. monopoly on Alberta oil exports. Leadnow for US$ 62,843 U.S. tax returns show. The original strategy paper for The Tar Sands Campaign. The first payment from the Rockefellers, back in 2007. Pages of the Rockefellers's tax returns (Rockefeller Brothers Fund) showing payments for $4 million (2007-2017) for the co-ordination of The Tar Sands Campaign. A tweet from the director of The Tar Sands Campaign, tweeting against Line 3. A page of the tax returns of Corporate Ethics International saying that this campaign targets both oil and natural gas. On Sunday, January 20, CBC's The Weekly aired an extensive report on the American funding that has been fuelling pipeline controversy and gridlock in Canada for more than a decade. This activist campaign is called The Tar Sands Campaign and it is a multi-million dollar effort to stop the construction of infrastructure necessary for the development and export of both oil and gas infrastructure from western Canada. Within days of CBC's show, the organization that has been running this campaign for more than a decade re-wrote its web-site, deleting significant parts of its own description of The Tar Sands Campaign, including admissions about the role of the U.S. funders, the intention to "land-lock" Canadian oil and the influence of this campaign in Canada's 2015 federal election. When The Tar Sands Campaign first came to light in 2010, little was known about it. In fact, this campaign was only discovered because of three little words, "Tar Sands Campaign," in the U.S. tax returns of The Tides Foundation ("Tides"). Based in San Francisco, Tides operates a donor-advised fund, receiving funds from donors and re-granting them to recipients. During the early years of The Tar Sands Campaign, the intentions and strategy of the funders was not entirely clear. In 2017, that changed when the organization that has been co-ordinating the campaign, Corporate Ethics International ("CorpEthics"), put a description of its on its web-site. The Tar Sands Campaign was created with initial funding from The Rockefeller Brothers Fund ("RBF"), one of the philanthropic entities of the famous family that pioneered the American oil industry. In 2007, RBF paid $250,000 to CorpEthics, "to co-ordinate the initial steps of a markets campaign to stem demand for tar sands derived fuels in the United States." CorpEthics wrote the strategy paper for The Tar Sands Campaign and has been running it ever since. Michael Marx, who wrote the original strategy, has been the Executive Director of CorpEthics since The Tar Sands Campaign began. The original description of The Tar Sands Campaign, published on-line by CorpEthics, stated that "From the very beginning, the campaign strategy was to land-lock the tar sands so their crude could not reach international markets where it could fetch a high price per barrel." CorpEthics has deleted that sentence entirely. Its web-site now states, "As hoped from the beginning, the tar sands campaign spawned a broader and more diverse climate movement that went beyond the tar sands..." CorpEthics now says that since The Tar Sands Campaign began, the climate movement has gone on to "challenge the expansion of U.S. oil production in the Bakken Reserve, oil drilling in the Arctic Ocean, oil fracking in states like New York, California, and Colorado, proposed natural gas and oil pipelines throughout the U.S., as well as the expansion of railroad infrastructure that would accommodate new oil production in the U.S". That's true. But those efforts are barely a whisper compared to the campaign to land-lock Canadian oil and gas. Corporate Ethics also removed a sentence about the role of the funders of The Tar Sands Campaign. That sentence said, "In 2008 two major U.S. foundations asked CorpEthics to recruit the groups, develop the strategy, create a coordinated campaign, and act as a re-granting agency for the North American Tar Sands Campaign." That revealing sentence has been entirely removed. To see how the description of The Tar Sands Campaign was originally written, click here. To see how it has been re-written, click here. For a set of pages showing the differences between the original and the re-written versions, click here. "Raise the negatives" by generating "a high negative media profile" about Canadian oil is one of the goals of The Tar Sands Campaign, as outlined in its original strategy paper (see page 4). Below is a list of 50 reports that have been produced and publicized by organizations that are funded as part of The Tar Sands Campaign. Canada's Toxic Tar Sands: The Most Destructive Project on Earth. Environmental Defence Canada. February, 2008. BP and Shell: Rising Risks in Tar Sands Investments. Greenpeace, Platform & Oil Change International. September, 2008. 11 Million Litres A Day: The Tar Sands Leaking Legacy Environmental Defence Canada. December, 2008. Danger In The Nursery: Impact on Birds of Tar Sands Oil Development in Canada's Boreal Forest, Natural Resources Defence Council. Lead Author: Jeff Wells, Ph.D., Boreal Songbird Initiative. Co-authors: Susan Casey-Lefkowitz, Natural Resources Defense Council, Gabriela Chavarria, Ph.D. (NRDC) and Simon Dyer, Pembina Institute. December 2008. Freedom from Dirty Oil: Ontario's Tar Sands Decision. Environmental Defence and Forest Ethics. Authors: Matt Price, Environmental Defence and Gillian McEachern, Forest Ethics. January, 2009. Divided We Fall: The Tar Sands vs. The Rest of Canada, Environmental Defence, Equiterre & Forest Ethics (now STAND). Authors: Gillian McEachern, Forest Ethics, Matt Price, Environmental Defence, and Jacques Lacroix, Equiterre. May, 2009. Out on the Tar Sands Mainline: Mapping Enbridge's Dirty Web of Pipelines. Polaris Institute. Written by Richard Girard, with contributions from Tanya Roberts Davis. May 2010, partially updated March, 2012. Tar Sands Invasion: How Dirty and Expensive Oil from Canada Threatens America’s New Energy Economy. Corporate Ethics International, EARTHWORKS, Natural Resources Defense Council and Sierra Club. Authors: Kenny Bruno, Corporate Ethics International, Bruce Baizel, EARTHWORKS, Susan Casey-Lefkowitz (NRDC), Elizabeth Shope (NRDC), and Kate Colarulli, Sierra Club. May, 2010. Staying Hooked on A Dirty Fuel. National Wildlife Federation. Written by Daniel Glick, The Story Group. The NWS acknowledges Tides Foundation for support for this publication. June, 2010. Les sables bitumineux du Canada: Les obligations du gouvernement fédéral. Equiterre, Pembina Institute and Environmental Defence Canada. October, 2010. Reserves Replacement Ratio in a Marginal Oil World. Written by Lorne Stockman, Research Director, Oil Change International. Acknowledgements: Stephen Kretzmann (Oil Change International), Charlie Kronick (Greenpeace) and James Marriott (PLATFORM). Reserves research by the Borealis Centre. www.borealiscentre.org. January, 2011. The Tar Sands Long Shadow: Canada's Campaign to Kill Climate Policies Outside Our Borders. Climate Action Network. Uploaded September, 2011. Exporting Energy Security: Keystone XL Exposed. Oil Change International. September, 2011. Pipeline and Tanker Trouble: The impact to British Columbia's communities, rivers, and Pacific coastline from tar sands oil transport. Authors: Anthony Swift, NRDC, Nathan Lemphers, Pembina Institute, Susan Casey-Lefkowitz, NRDC, Katie Terhune, Living Oceans Society and Danielle Droitsch, NRDC. This report is endorsed by Dogwood Initiative, Douglas Channel Watch, ForestEthics, Friends of Wild Salmon, Headwaters Initiative, Pacific Wild, Raincoast Conservation Foundation, Sierra Club BC, and West Coast Environmental Law. November, 2011. Keystone XL Pipeline: Undermining U.S. Energy Security and Sending Tar Sands Overseas. Authors: Anthony Swift of NRDC, Lorne Stockman of Oil Change International and Luke Tonachel of NRDC. January, 2012. Enbridge Pipe Dreams and Nightmares: The Economic Costs and Benefits of the Proposed Northern Gateway Pipeline, Centre for Policy Alternatives, Written by Marc Lee. March, 2012. Dirty Oil Diplomacy – The Canadian Government’s Global Push to Sell the Tar Sands. Climate Action Network Canada, Environmental Defence, Greenpeace, Natural Resource Defence Council, Sierra Club and Equiterre. Keystone XL: A Tar Sands Pipeline To Increase Oil Prices. Natural Resources Defence Council. Author: Anthony Swift. 2012. Petroleum Coke: The Coal Hiding in the Tar Sands. Oil Change International. Researched and written by Lorne Stockman with contributions from David Turnbull and Stephen Kretzmann. January, 2013. Cooking The Books: How The State Department Analysis Ignores The True Climate Impact of the Keystone XL Pipeline. This report bears the logos of Oil Change International, Greenpeace, Friends of the Earth, Environment America, NRDC, 350.org, Sierra Club & National Wildlife Federation. April, 2013. Keystone XL: The Key to Crude Exports – New Report. Oil Change International. July, 2013. Reality Check: Water and the Tar Sands. Environmental Defense Canada. This report bears the logos of NRDC, 350.org, Forest Ethics (STAND) and Athabasca Chipewyan First Nation. September, 2013. FAIL: How the Keystone XL Tar Sands Pipeline Flunks the Climate Test. This reports bears the logos of Sierra Club, 350.org, Bold Nebraska, CREDO Action, Environment America, Environment Maine, Friends of the Earth, Green America, National Wildlife Federation, Oil Change International and Public Citizen. Authors: Kate Colarulli, Sierra Club, Doug Hayes, Sierra Club, Courtenay Lewis, Sierra Club, Lorne Stockman, Oil Change International, David Turnbull, Oil Change International. September, 2013. Economics of Transporting and Processing Tar Sands Crudes in Quebec. The Goodman Group, Ltd. in collaboration with Équiterre and Greenpeace Canada. January, 2014. Reality Check: Climate Change and The Tar Sands. Environmental Defence Canada. April, 2014. Dirty Deals: How Trade Talks Threaten To Undermine EU Climate Policies And Bring Tar Sands To Europe, Friends of the Earth Europe, Transport & Environment, Sierra Club, Greenpeace, Council of Canadians & Friend of the Earth USA. Researched and written by Fabien Flues. Contributions and edits by: Natacha Cingotti, Colin Roche, Paul Hallows, Ilana Solomon, Laura Bu and Franziska Achterberg. The authors of this report acknowledge funding from the European Climate Foundation. Fossil Fuel Subsidies An analysis of federal financial support to Canada's oil sector. Pembina Institute. Authors: Sarah Dobson and Amin Asadollahi. July, 2014. All Risk No Reward: The Alberta Clipper Tar Sands Pipeline Expansion. Sierra Club. March, 2014. Energy East: Where Oil Meets Water. Council of Canadians. The Council of Canadians thanks the following individuals and groups that provided information for this report: Andrea Harden-Donahue, Emma Lui, Jesse Ranauta, Jim Ellio , Teika Newton, Jim Sinclair, Brennain Lloyd, Yan Roberts, Kelly-Anne Smith, Ian Angus, Ma Abbo , Shelley Kath, Ecology O awa, Équiterre and the Conserva on Council of New Brunswick. August, 2014. Wrong Side of the Tracks: Why Rail is not the Answer to the Tar Sands Market Access Problem. Oil Change International. Researched and written by Lorne Stockman with contributions by Hannah McKinnon, Steve Kretzmann and Shakuntala Makhijani. September, 2014. Material Risks: How Public Accountability Is Slowing Tar Sands Development. Oil Change International and Institute for Energy Economics & Financial Analysis. Researched and written collectively by Tom Sanzillo, Lorne Stockman, Deborah Rogers, Hannah McKinnon, Elizabeth Bast, and Steve Kretzmann. Assistance and/or additional contributions from Adam Wolfensohn, and Amin Asadollahi. October, 2014. Pipeline Peril: Threat to Wildlife in the Great Lakes Region. National Wildlife Federation, Minnesota Environmental Network and Prairie Rivers Network. Authors: Shelley Kath, Paul Blackburn & Jim Murphy. December, 2014. On the Edge: 1.6 Million Barrels per Day of Proposed Tar Sands Oil on Life Support, Oil Change International. Researched and written by Hannah McKinnon and Lorne Stockman, with support from Elizabeth Bast, Stephen Kretzmann, and Greg Muttit. May, 2015. Tar Sands At Our Doorstep: The Threat to the Lake Champlain Region's Waters, Wildlife, and Climate. National Wildlife Federation, Environmental Advocates of New York & Vermont Natural Resources Council. Authors: Jim Murphy and Sheridan Brown, National Wildlife Federation. Stop Tar Sands Oil Expansion and Infrastructure. Natural Resources Defense Council. August, 2015. Quantifying Risk: Calculating The Probability of an Energy East Pipeline Rupture. September, 2015. Lockdown: The End of Growth in the Tar Sands. Published by Oil Change International. Written by Hannah McKinnon, Greg Muttitt and Lorne Stockman. October, 2015. Tar Sands: The Myth of Tidewater Access. Oil Change International, The Natural Resources Defense Council, Environmental Defence. Researched and written by Hannah McKinnon, Lorne Stockman, Greg Muttitt, Anthony Swift and Adam Scott. March, 2016. Energy East: A Risk To Our Drinking Water. Environmental Defence, Transition Initiative Kenora & The Council of Canadians. Report Partners: Conservation Council of New Brunswick, Equiterre, Greenpeace Canada, Northwatch & Manitoba Energy Justice Coalition. April, 2016. Tar Sands in the Atlantic Ocean: Transcanada’s Proposed Energy East Pipeline. Natural Resources Defense Council. July 2016. Flawed Fundamentals – Shell’s and BP’s Stalled Tar Sands Ambitions. Oil Change International and Greenpeace UK. September, 2016. The Elephant in the Room: Canada’s Fossil Fuel Subsidies Undermine Carbon Pricing Efforts. Oil Change International, Environmental Defence, Équiterre, and Climate Action Network Canada. November, 2016. Climate on the Line: Why New Tar Sands Pipelines Are Incompatible With the Paris Goals. Oil Change International. Researched and written by Adam Scott and Greg Muttitt. January, 2017. Betting on Bitumen: Alberta’s Energy Policies from Lougheed to Klein. Parkland Institute and the Canadian Centre for Policy Alternatives. Author: Gillian Steward. June 2017. Reality Check: The End of Growth in the Tar Sands. Oil Change International and Bold Alliance. Researched and written by Lorne Stockman and Hannah McKinnon with contributions from Greg Muttitt and Adam Scott. In the Pipeline: Risks for Funders of Tar Sands Pipelines. Researched and written by Greenpeace UK, Greenpeace Canada, Greenpeace USA and Oil Change International. October, 2017. Funding Tar Sands: Private Banks vs. the Paris Climate Agreement. This report bears the logos of Rainforest Action Network, Oil Change International, BankTrack, Indigenous Climate Action, Last Real Indians, Les Amis de La Terre France, Mazaska Talks, Re:Common, Sierra Club, Treaty Alliance against Tar Sands Expansion, UK Tar Sands Network, and urgewald. November, 2017. Problematic Pipelines: The many obstacles facing Keystone XL. Written by Greenpeace UK and Greenpeace USA. Endorsed by Bold Alliance, Natural Resources Defense Council, Oil Change International and Rainforest Action Network. February, 2018. Risking It All: How Export Development Canada's Support for Fossil Fuels Drives Climate Change. Oil Change International in partnership with Above Ground, the International Institute for Sustainable Development, Environmental Defence Canada, Equiterre, and Climate Action Network Canada. Researched and written by Alex Doukas and Adam Scott, Oil Change International. November, 2018. According to your web-site, you have created 650 charities and executed >$2 billion worth of charitable giving. Because of the substantial tax relief associated with TWO BILLION DOLLARS in charitable giving, I believe that your work is a matter of public interest to Canadians. This is why I have looked into your charities so extensively and why I am writing this open letter to you. As you are aware from our correspondence since the spring of this year, I have done an extensive analysis of the financial data in the tax returns for more than 100 charities under your direction or co-direction. For 75 charities, I have compiled detailed information (click here). All or nearly all of these 75 charities are run out of your Vancouver office and by your employees/associates so it makes sense to me to examine their charitable contribution as a whole. As far as I can tell, 35 of the 75 charities account for the bulk of the transactions made by these entities. For most of the 35 charities, I find that the figures in the tax returns are not a true reflection of their charitable activity because of the circular grant-making amongst these charities. Combined across all 35 charities, total expenditures are roughly $1.1 billion. I find that this figure has been inflated by at least half a billion dollars due to circular grant-making. Total tax-receipted donations for the 35 charities are roughly $600 million. According to my analysis, less than $100 million of that has been spent on actual charity. I do not see any way that remaining assets could account for the gap between what has been spent on actual charity and what your charities have reported as tax-receipted donations. What charitable purposes were served with the $242 Million in tax-receipted donations to Sea to Sky Foundation and Stewart & Marilyn Blusson Foundation? For what charitable purpose did Sea to Sky Foundation and Blusson Foundation pay $240 Million for interest and bank charges, and other, unspecified expenses? Were the recipients the same parties that made tax-receipted donations for $242 million? Put plainly, did the donor(s) get their “donation” back – in addition to the tax relief? What charitable purpose was served with the $100 million in tax-receipted donations to Global Charity Fund ($70 million) and Association for the Advancement of Scholarship ($30 million)? I also feel that it is necessary to raise questions about the grant making by Chimp Foundation. Chimp has received about $111 million from some of the very same charities to which Chimp has granted nearly the same amount ($100 Million). What charitable purposes have been served with the $100 million paid to Chimp Foundation by these charities? Put plainly, how much of the $100 million did Chimp spend on actual charity and how much does Chimp just road-trip in circles? If I have presented anything here that is factually incorrect, or if I have missed any important points, please let me know. Disclaimer: This blog offers the author's opinions and the analyses on which they are based. As I've said before, questions need to be asked about the oversight of registered charities by the Charities Directorate at the Canada Revenue Agency. Initially, I came to this conclusion because of how the Charities Directorate handled the controversial audits of the political activity of registered charities. Further to that, on the basis of additional research into the revenue and expenditures of Chimp Foundation and a network of charities that shares a common core of directors with Chimp, it is clear to me that there is some monkey business going on in the charitable sector and that, unfortunately, the Charities Directorate is allowing some charities to run amok. Click here to continue reading about how I came to look at the financials of Chimp Foundation, and what I found. 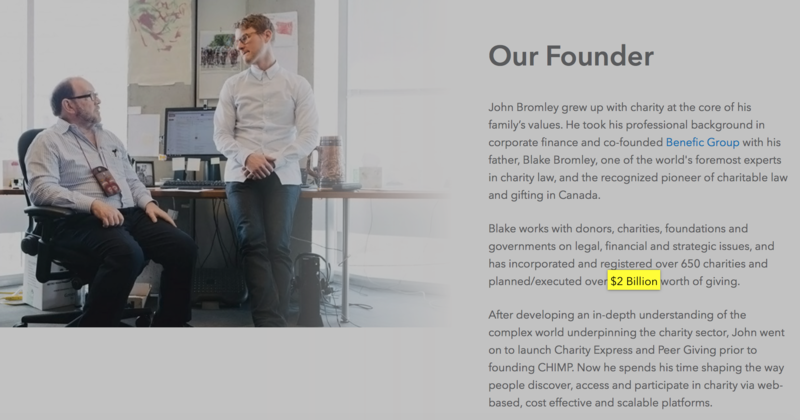 Blake Bromley, a Vancouver-based lawyer, claims to have registered more than 650 charities and executed more than $2 billion worth of charitable giving. Mr. Bromley refers to himself as "one of the world's foremost experts in charity law, and the recognized pioneer of charitable law and gifting in Canada." Of the 650 charities that Mr. Bromley has been involved with, so far I have taken a look at the finances of 70 registered charities. Of these, the charitable status of 20 has been revoked; seven had their status revoked following an audit by the CRA while 13 revoked their status voluntarily. All of these charities share a common core of directors, including Blake Bromley and the employees of his company, Benefic Group. 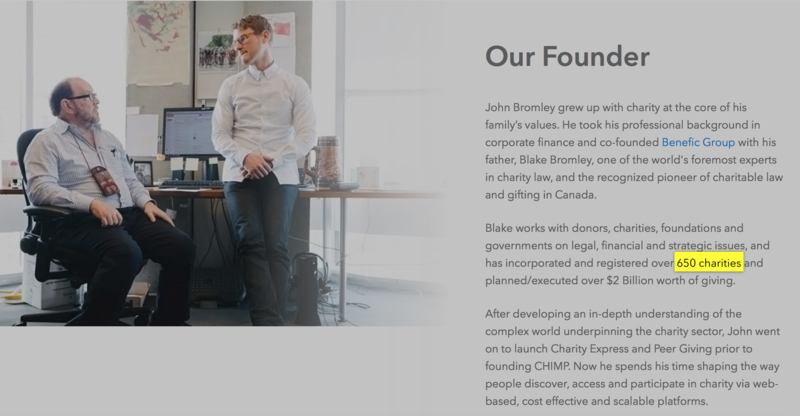 Click here for a summary of my analysis of the revenue, expenditures and grantmaking of 25 charities where Blake Bromley is involved. Have a look at the pattern of revenue and expenditures of these 25 registered charities and ask yourself, is this charity?